I have not seen anyone use "regular white bread" in as many avatars as my Mother. It could be due to the fact that we mostly lived in small towns where buying sweets or shingaras for snack, or when an impromptu guest arrived, was not the easiest thing to do. 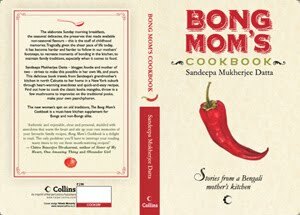 It could also be due to the fact that we did not have a refrigerator(until I was in 8th grade) and so stocking sandesh and roshogollas for a guest who lands out of nowhere was not possible.It could also be due to the fact that my Mother had this amazing talent of making delicious edibles out of practically nothing. One thing we did buy regularly was "a loaf of sliced bread". Buttered toasts appeared frequently with tea in the morning.But how much buttered toast can a Bengali household consume after all ? And so rest of the bread showed up at snack time in different avatars. Neighborhood aunties dropping by for evening tea in winter, meant my Mother would make bread pakora by simply dipping slices of bread in a spiced besan batter and frying them in hot oil. If it was hot summer, she would simply rustle up a paurutir dahi vada (bread dahi vada) with the yogurt spiced up with some imli chutney from neighborhood Jain Aunty. For dessert, she would make paurutir malpoa(bread malpua) where squares of bread were fried crisp and then soaked in a sugar syrup until they became soft and melt in the mouth. My father was an avid sweet lover and he needed a dessert every day of the week. This helped! The Shahi Tukda or Paurutir Rosh Malai was made only when guests came invited for dinner though. It involved a little more work in thickening the milk and making the rabri and so was not really impromptu. However once my Ma discovered "Gits Rabri Mix", even this became a super fast dish in her kitchen. 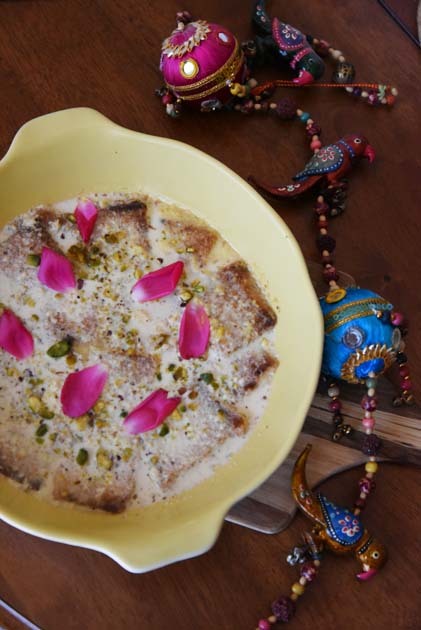 I did not know that this very simple dish that happened in my Mother's kitchen had a fancy name of "Shahi Tukda" and a fancier lineage, until our dessert connoisseur friend T served it one day. Her version looked fancier than my Ma's, who never bothered with garnishing and such. "It is popularly believed that Shahi Tukray was a favorite of the Mughal emperors to break fast with in the month of Ramazan, thus the practice continues even today making it a very desirable dish at iftar, and a meetha famously served at the festive occasions of Eid-ul-Fitr and Eid-ul-Azha. There are many who claim that Shahi Tukray evolved from Um Ali an ancient Egyptian bread pudding. Legend has it that a Sultan with a group of hunters was hunting along the River Nile when they stopped in nearby village for some food. The villagers called upon their local cook Um Ali to cook up a meal for the hungry guests. The chef mixed some stale wheat bread, nuts, milk and sugar, and baked it in the oven. And thus the delicious Um Ali came to be. Another legend claims Um Ali to be a victory dessert made to order by a succeeding king." While Shahi Tukda owes its origin to the Mughal emperors, the royals of Hyderabad had adapted this dish to make "Double ka Meetha", probably named so as bread was called "double roti" in Hindi. Whatever you wish to call it and however fancy it may sound, it really is the easiest thing to make. And isn't it a beautiful coincidence that I made it during the holy Ramadan ?